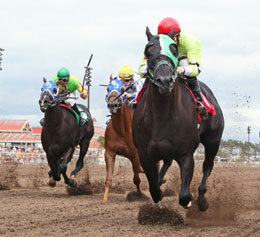 Sportswagon, under jockey Ry Eikleberry, drives to finish in the Minesota QH Futurity on Sunday at Canterbury Park. SHAKOPEE, MN�SEPTEMBER 1, 2013�Sportwagon won the $34,650 Minnesota Quarter Horse Futurity by one length Sunday at Canterbury Park, providing owners and breeders Robert and Julie Petersen of Cokato, MN with their fifth win in that race and their ninth Minnesota Festival of Champions victory. The 2-year-old quarter horse was a maiden entering the race but was bet to favoritism and returned $3.00 to win. Ry Eikleberry was aboard for trainer William Harris. Final time for the 350 yards was 17.954 seconds. Sportwagon simply ran away from eight rivals to add another trophy to the burgeoning collection of Canterbury Park�s newest Hall of Fame entrants from the quarter horse ranks, Bob and Julie Petersen. Horses owned by the Petersen's finished one-two. Good Eye was a length back of her winning stablemate. Justa Bump was next, followed by Little Bit Brandy. Sportswagon, by Pyc Paint Your Wagon is out of the Petersen's' campaigned Inclinda. The winner of the 2003 Cash Caravan Stakes is sired by Blushing Bug. She earned $17,326 for the win. Harris also saddled Good Eye, a filly ridden by Marcus Swiontek. She earned $6,930. Justa Bump races for owner/breeder Eugene and Rita Boehlke. Robert Don Johnson saddled. Ridden by Justin Shepherd Justa Bump picked up $5,198 for the effort. Completing the field were Little Bit Brandy, Furys Sol, Furys Folly, Streak N Talent, Dirt Road Queen and Irish Brew. Trainer Ed Ross Hardy won his record 17th Festival race when V Os Red Hot Cole prevailed in the $32,900 Minnesota Quarter Horse Derby. Hardy has won at least one of the two Festival of Champions races each of the past seven years. V Os Red Hot Cole broke alertly and led the entire 400 yards, holding off favorite Tres My Tracks by three-quarters of a length in a final time of 20.635 seconds with Rusty Shaw riding. First Down Marie was third. V Os Red Hot Cole paid $6.40 to win. V O�s Red Hot Cole is back in fine fettle, fully recovered from the banged-up foot that hampered him in recent weeks. Von Ohlen is no stranger to the winner�s circle at Canterbury. For instance: V O�s Red Hot Cole is out of Miss Eyewear, the same mare that foaled Von Ohlen�s First Class Smarty, winner of the Bob Morehouse twice, the Canterbury Park Derby and the Northlands Futurity among others. As Shaw stepped on the scale in the winner�s circle, a bystander commented. �Hey, Rusty, riding in the All American (Monday) this year.�� �Yeah, I wish,�� he responded. For the moment, however, Shaw, Von Ohlen and trainer Ed Ross Hardy had all they needed. Tres My Tracks, by Tres Seis, races for owner/breeder Tom Pouliot and is trained by Amber Blair. Ry Eikleberry rode the gelding out of Leans Rare Lady, by Rare Form. He earned $6,580. Robert Don Johnson saddled First Down Maries, a Sweet First Down filly, for owner Mark Wilson. Jon York bred the sorrel miss from the This Snow Is Royal mare Alissanos. Ridden by Justin Shepherd she earned $4,935. Ridiculicious, Afterallitseasy, Carless Gun and Itsmyeffort completed the field. The Minnesota Festival of Champions is a day of racing restricted to Minnesota bred quarter horses and thoroughbreds and in this the twentieth edition offers nearly $500,000 in purses.